Day two of the Diploma arrived after a three week break. During those three weeks we weren't particularly guided regarding what to study next, so it's fair to say I didn't really make the most of the time. A bit of reading around grape-growing and pruning was time well spent though. Again, in the absence of advice regarding what to bring, I opted for just my tasting glasses (purchased from the WSET on day one) and the Unit Two handbook, which transpired to be the correct decision (note, we used eight glasses, not just six, during this session). The first half of the day was dedicated to viticulture, which was every bit as chemical / biological / geological as it sounds. From root stocks to parasites, cloning to site selection, this was one of the most information-rich lectures of my recent life. Having just come out of two years of studying Forensic Psychology at Masters level, this is really saying something! I arrived at lunch time with 15 A4 pages of notes, and the lecture itself really skimmed just the essentials from the accompanying text, which is densely packed with detail. This is not to say there wasn't time for tasting - we assessed eight wines during the session - simply that this is a lecture to bring your 'A game' to if you intend to maximise your learning potential. I would also seriously recommend reading the relevant chapter from the Unit 2 handbook in the week before you go: any head start you can give yourself will really pay off when it comes to digesting the information. 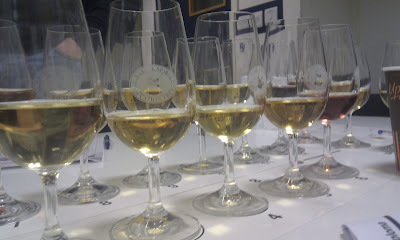 The afternoon session marked a welcome change in pace as we turned to look at sticky wines. To anyone who has passed the WSET Advanced certificate (or Level Three, as it's now known), the basic production methods of these wines should be easily understood, which put the emphasis more on tasting and assessing the wines rather than straight, hard facts. The line up of stickies was quite an event in itself: even for someone 'in the trade' it is uncommon to taste through an array such as this. It still amazes me quite how sweet a wine can be before being officially classed as 'sweet', but I shall let you discover that detail for yourself. Having been rather busy of late, I am only publishing this entry the night before Session Three, so it won't be long before I'm back to update you with another day.